Has anyone ever used Hog Hill Works' Rolling Roads stationary rollers? I'm interested in there 'dummy' versions, since I don't need track power. Any comments are appreciated! EDIT: Or has anyone built something from scratch? I haven't used that particular brand, but they are all similar.. I would have thought you could source something from your side of the pond? - Less carriage-cost, perhaps? I would suggest you get insulated ones though. 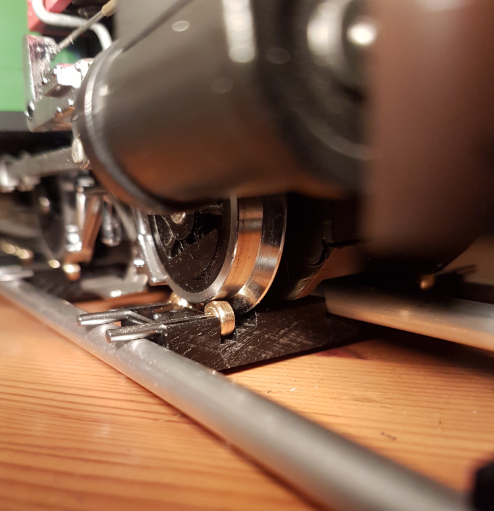 That way you can test a track-powered loco, before you start converting, or if you want to keep the odd track-powered loco. 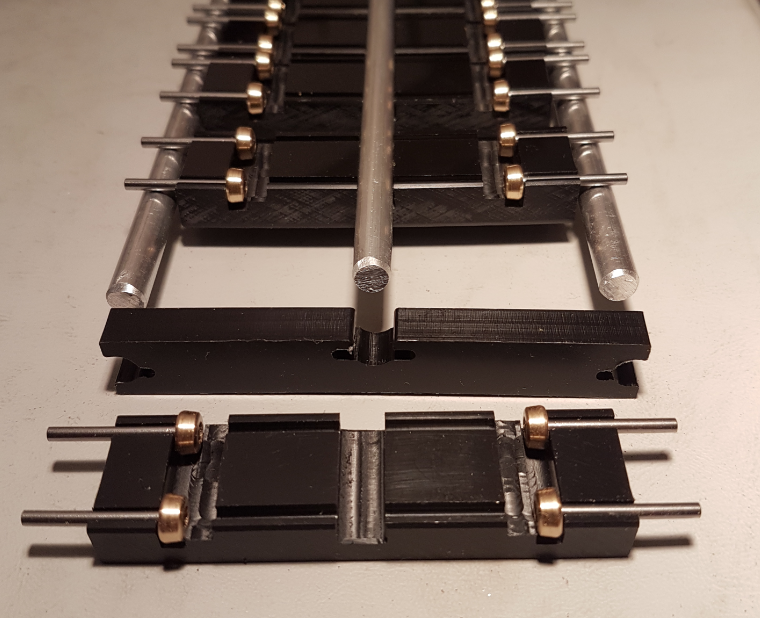 I have four sets of rollers, which sit on a length of track on the bench.. 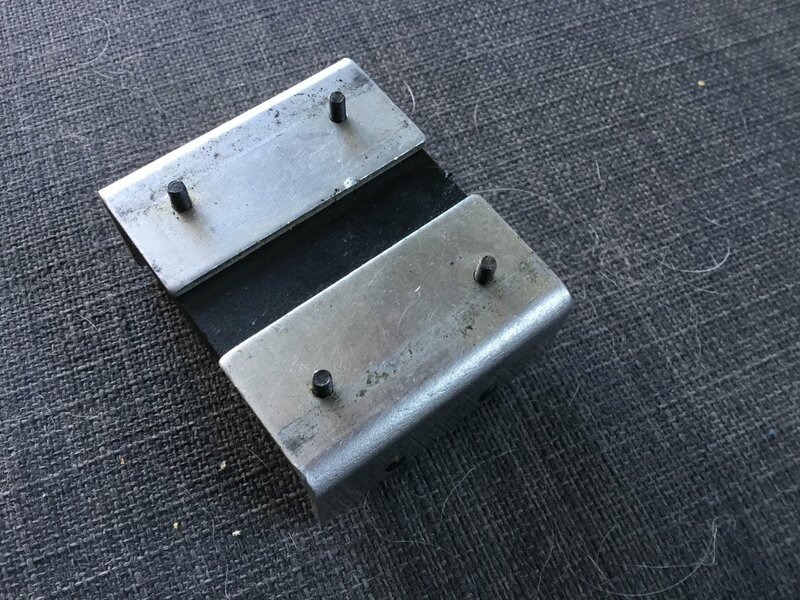 The box contains the metal 'stirrups', which cna be used to power a tender. - Never had them out of the box! Mine are made by Bachrus Inc. Oakville ON L6H 2C5 Canada. But the registration of the domain has just expired..
Well, I'm looking for something cheaper. 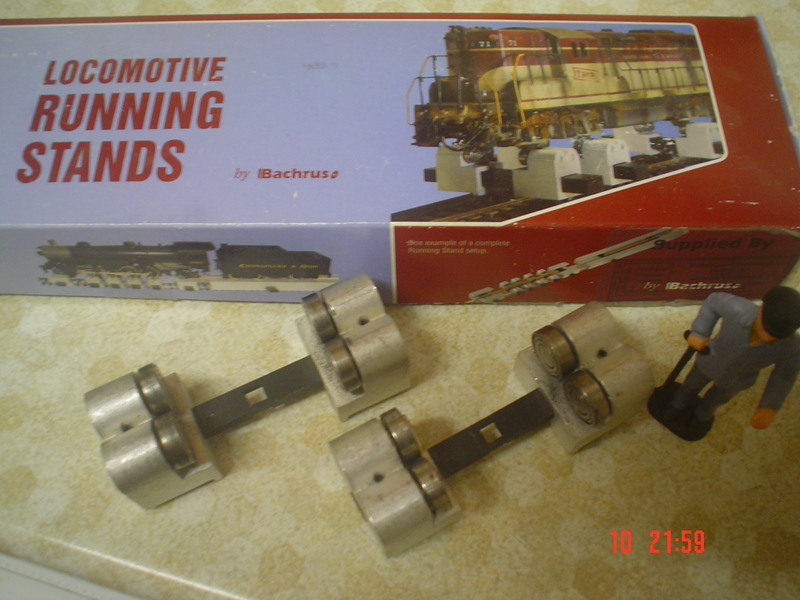 The only ones I can find here are Bachmann, which are $44.00/pair. Not sure what shipping to US would cost though?? John, Accucraft makes some nice ones and are located in California. Their web site is at https://www.accucraftestore.com/ Their part number is AP28-301 and are called treadmills. They are about $20 each with four bearings (two per side) for one axle to sit on. Although, they are currently shown as out of stock, they may be able to tell you when they are receiving more. You could also try calling Mark at Silver State Trains at 702-361-2295 or Silver State Trains. Mark is an Accucraft dealer and may have some. It may be more than you want to spend but AllAboutLGB.com has the Massoth rolling road set for $57.90. I've made multiple purchases from them and had good service. I may also be able to fabricate something. 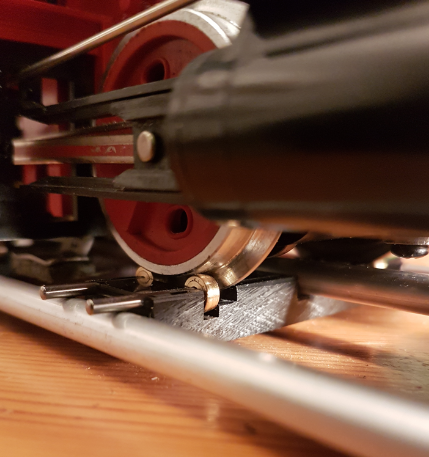 You can always pop a block of wood under each bufferbeam.. - Everything 'just hangs', but is better than nothing..
A word of warning, I have asimilar looking rolling road (Aristo-Craft I think), and the wheel flanges catch on the centre support, so do not roll! This is one of my set of 4, Aristo or Bachman not sure which. Have been using them for both Live Steam and Electrics with no problems at all. 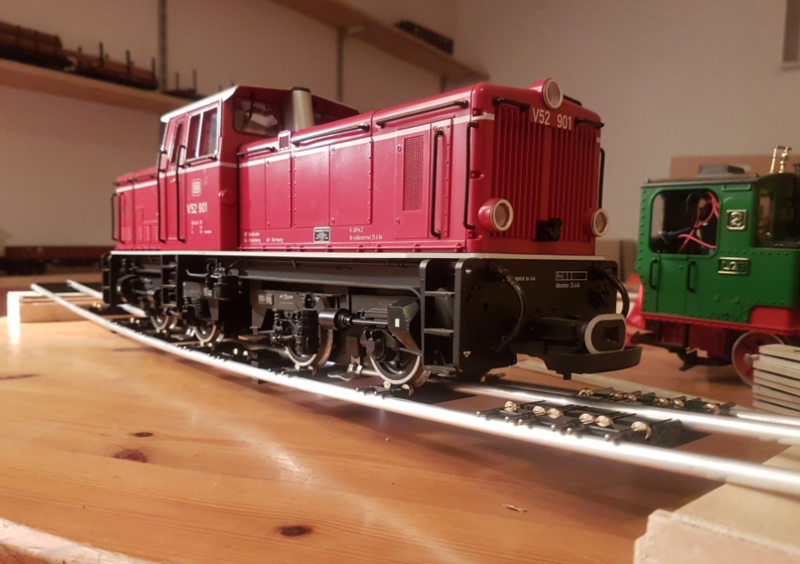 I even use them without Track quite happily. 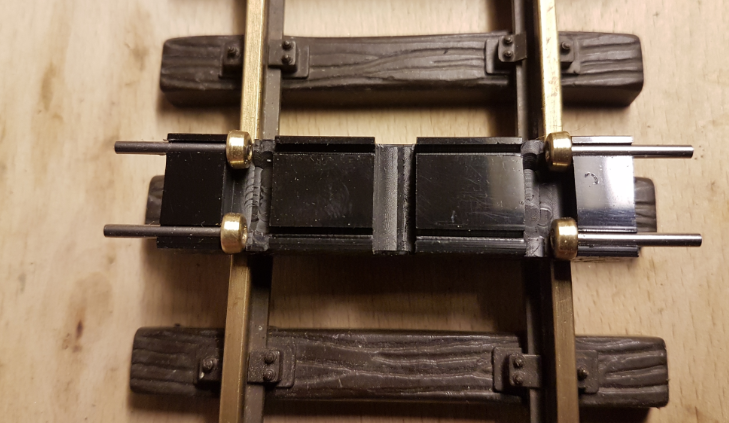 If using on track the screws at the bottom cleverly align to make it all satisfactorily aligned. But with any Locomotive a bit of faffing to get the spacing right. On big lumpy 2-10-2’s I just let the middle wheel and bogies dangle whereever they are. Oh crumbs and dog hairs! Jon the ones I have for my 0 Gauge are of that design and work well. 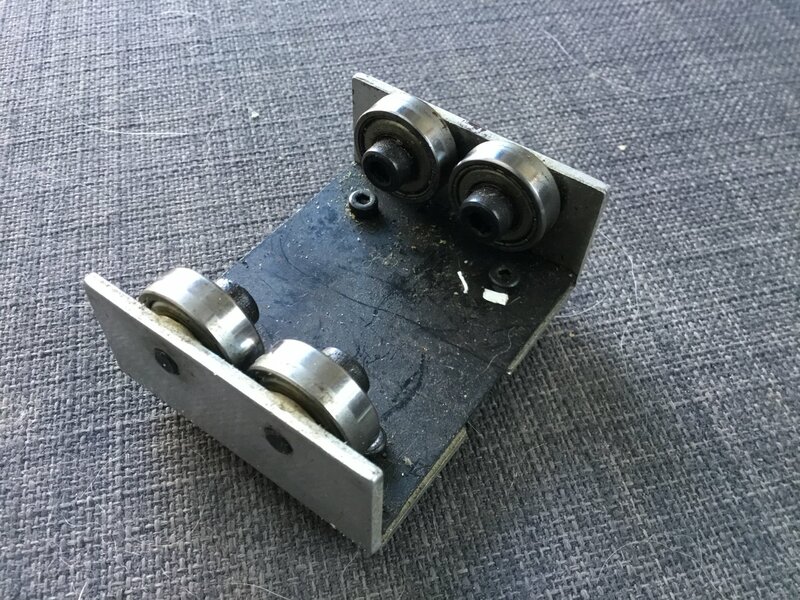 The Train Department <thetraindepartment.com> has dual gauge test rollers for $26 per pair (one axle). Listed under Live Steam Parts and Accessories. The TDRR brand is for items produced Jason Kovacs at the Train Dept. I don't have any of his rollers, but what I have bought was high quality. If you order, he will email an invoice payable thru Intuit. If they won't send to the States, you could get them to send it to me, and I could send it on..
Of course, you would have to win it first! I can make you a very attractive offer on a 1000mm Marion-Zeller 1/LGB/G rolling road setup with 6 dollies. It looks very similar to what's in the EBay listing posted by Phil P. above. See www.mazero.de. 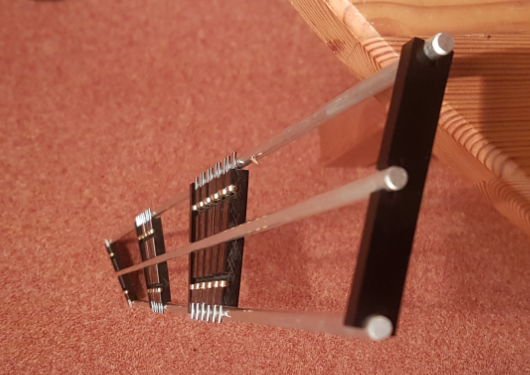 I'll be honest - the quality is good and they're well made but I had trouble with them. Locomotives would jump the rather small bearings if operated above anything but the slowest speed. I tried fiddling with them somewhat but gave up and bought a couple of sets of Massoth rolling roads. If you're interested send me a PM. 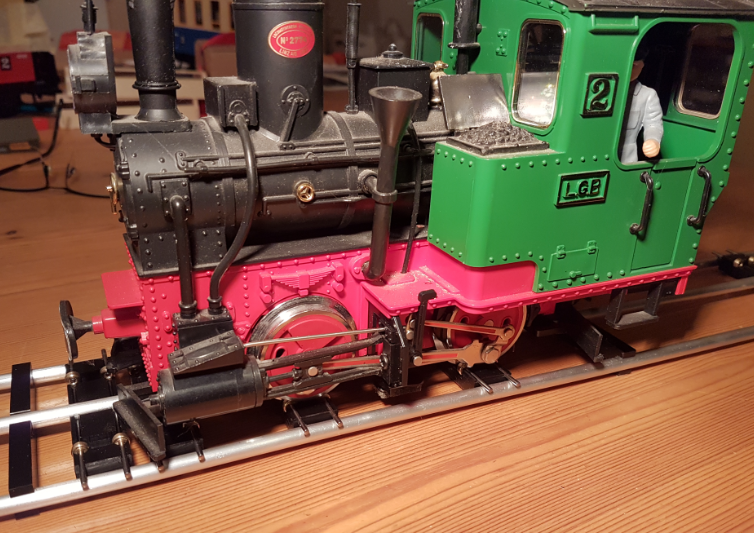 The basic design principle - so even the LGB "Pizza slicer" wheel flanges fit into the roller stand - see "Rusty" & "Stainz"
KPF Zeller also offers "speed cats" to measure the prototypical speed of your loco, see video. Data can be transferred to Win Digipet etc., so I could imagine that this could be a useful tool to prepare consist-operations. How robust (strong) is this please? - Could you pick it up (at the ends?) with a loco on it? I think it is designed to rest on a flat surface.